Sen. Steve Huffman is pictured with Tipp City donor Steve McCrillis. TIPP CITY – State Sen. Steve Huffman (R-Tipp City) can go from the statehouse to the emergency room to a mobile blood drive and always feel right at home. On Thursday he visited the United Methodist Church blood drive in his hometown of Tipp City to thank donors for supporting the first celebration of January Ohio Blood Donor Awareness Month. Huffman, a lifelong blood donor and an ER doctor, sponsored House Bill 252 designating January “Ohio Blood Donor Awareness Month” while representing the Ohio House 80th district. He was sworn in as senator for the 5th district on Jan. 7 and a few days later visited the Dayton Community Blood Center to donate with his family. The stated goal of the new legislation is to increase awareness of the need for blood donations, to encourage more people to give blood and to recognize the lifesaving contributions of blood and platelet donors. CBC is emphasizing the strategic goal of identifying and recruiting a new generation of platelet and plasma donors and providing more opportunity for these donations at mobile blood drives. 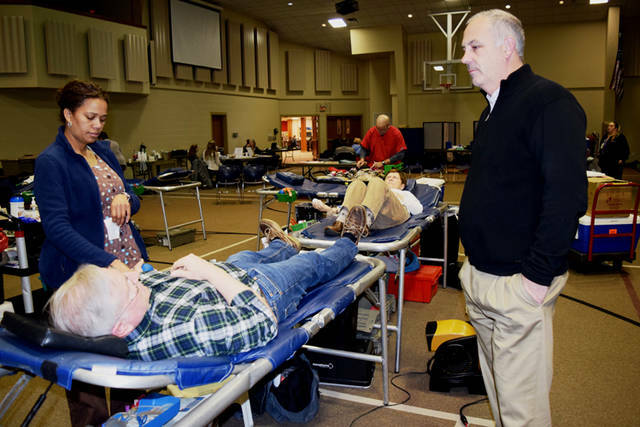 Beginning Thursday, the United Methodist Church introduced expanded blood drive hours from 1:30 to 7:30 p.m. and for the first time included machines for platelet and plasma collection. Donations increased 35 percent Thursday, totaling 81 whole blood donors and 70 whole blood donations plus seven platelet donations for 117 percent of goal. The church hosts blood drive every two months with the next scheduled for March 21. “I didn’t have a clue what it was,” new platelet donor Gaye Gabel from West Milton said. Troy donor Brenda Bodey is a retired postmaster who recently returned to donating after surviving a scare from malignant melanoma. As a type A positive donor, Bodey is a candidate for platelet donations, and she is now considering it. Sen. Huffman made the rounds of the blood drive visiting donors. He congratulated Tipp City neighbor Marjorie Jordan on her milestone 100th lifetime donation. Huffman’s friend and fellow donor Steve McCrillis praised him for the Ohio Blood Donor Awareness Month legislation. “I think it’s a good idea to provide more donors and more vision of what’s going on and the opportunities to give,” he said.